Olly Murs is a British singer-songwriter who rose to fame after coming second on the X Factor in 2009. He has since become one of our most successful pop stars with a number of hit studio albums to his name including ‘In Case You Didn’t Know’ and ‘Never Been Better’. He released his fifth studio album, 24 Hrs , in 2016 which debuted at number one on the UK Albums Chart. In October 2017, it was confirmed by ITV that he had become a coach on the seventh series of The Voice UK. 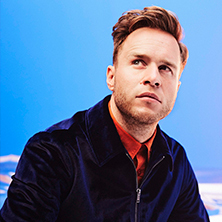 Eventim is the place to look for Olly Murs tickets and tour dates. To be the first to hear when more Olly Murs tickets go on sale you can sign up to the Eventim Ticket Alarm below.